We're celebrating the most popular big-block RC monster truck in the world with the release of a fresh new body design! Introducing a stealthy new look for the Savage X 4.6, with a Silver/Black paint scheme alongside a Silver/Gunmetal scheme for a new take on monster truck looks! 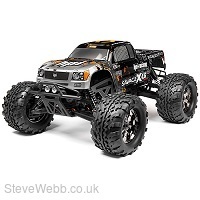 The Savage X 4.6 features the fantastic GT-3 truck body in two pre-painted colour choices, Silver/Black or Silver/Gunmetal. The GT-3 body comes completely trimmed, decaled and mounted for the ultimate in ease. The intricate paint designs feature an action sports inspired layout for concours quality appearance. And you can always customize your truck with any of the clear or pre-painted polycarbonate body shells from the huge assortment of HPI bodies and other manufacturers as well! For great looks, the Savage X 4.6 is topped off with a clean set of black chrome Warlock wheels, a grey anodized engine head, and orange anodized aluminium parts. The RTR Savage X 4.6 has beefy suspension arms that can take the punishment of big-air drops and top speed runs over bumpy terrain. Keeping everything protected is the reinforced "X" TVP (Twin Vertical Plate) chassis, which features thick aluminium plates and custom 'X' graphics. Extra material was added to the skid plates and bumper to help the Savage X 4.6 survive huge jumps and crashes. The thick engine mount and engine plate give the truck amazing durability and endurance, especially when you're landing massive jumps! The Savage X 4.6 is the most user-friendly Savage ever, allowing you to access all of the key areas with minimal disassembly. For example, the centre gearbox is split into four separate pieces to allow for access from the top without dissembling the TVP's. Diff access is also easier than ever with no chassis removal required. No matter what part of the truck you are trying to access, it can all be done in record breaking time! The massive F4.6 Big Block engine is designed for one thing and one thing only - huge amounts of horsepower! Nearly 3hp, in fact! Enough horsepower to get the Savage X 4.6 to speeds over 45mph (73kph)! And Big Block TORQUE is always on tap, just pull the throttle and you'll know you're not driving a small block. You want speed? You want torque? You've got it! Rough off-road terrain and extreme stunts are not a problem with this engine! You get toughness as well as speed: the F4.6 features true ABC construction (aluminium piston, Chrome-plated Brass sleeve), 8 port tuning, a 7.5mm composite carburetor, and a heavy duty triple shoe clutch. A dual-stage air filter protects the F4.6 from dust and dirt kicked up by the 4WD action! Our designers wanted to make sure the Savage X 4.6 drivetrain could handle the extra power of the Nitro Star F4.6. The Savage drivetrain features a permanent 4WD system and spins on rubber-sealed ball bearings. The proven 2 speed transmission uses tough metal gears for durability, and has adjustable shift points for the ultimate tuning. To add extra strength, aluminium alloy diff cases are standard on the front and rear differentials, pre-installed and shimmed to extend the maintenance interval of the HPI 4-gear differential. The adjustable slipper clutch features a durable slipper pad, so there's less maintenance and more driving! Finally, to make sure you can stop this beast quickly, the Savage X 4.6 is equipped with a twin vented disk brake made from heat-resistant fiber material to give you more stopping power! 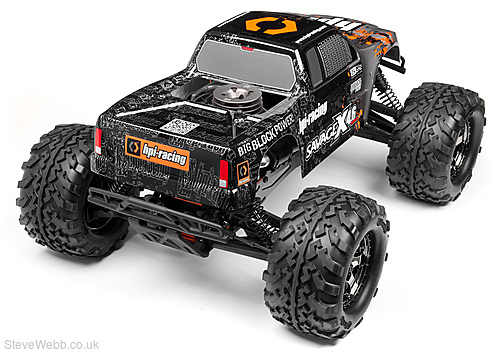 Head to any track and it's easy to see the HPI Savage is the most popular monster truck around. With unrivaled backing in the form of toll-free HPI customer service, knowledgeable hobby shop staff, fanatical owners, outstanding online support, plus a huge racing scene, the Savage is not only the most popular big-block monster truck around, it's the best supported! In addition to personal and friendly advice from tuners, racers and shop staff, a huge range of option parts are available from HPI and a massive assortment of other aftermarket manufacturers! Choose from anodized aluminium parts in a rainbow of colours, pure racing options like lowered chassis plates, big horsepower upgrades like giant engines, durability options to handle the extra power, functional add-ons like HPI's illuminated battery level indicator, plus pure 'bling' bolt-ons like sweet custom chrome wheels and funky treaded tyres!